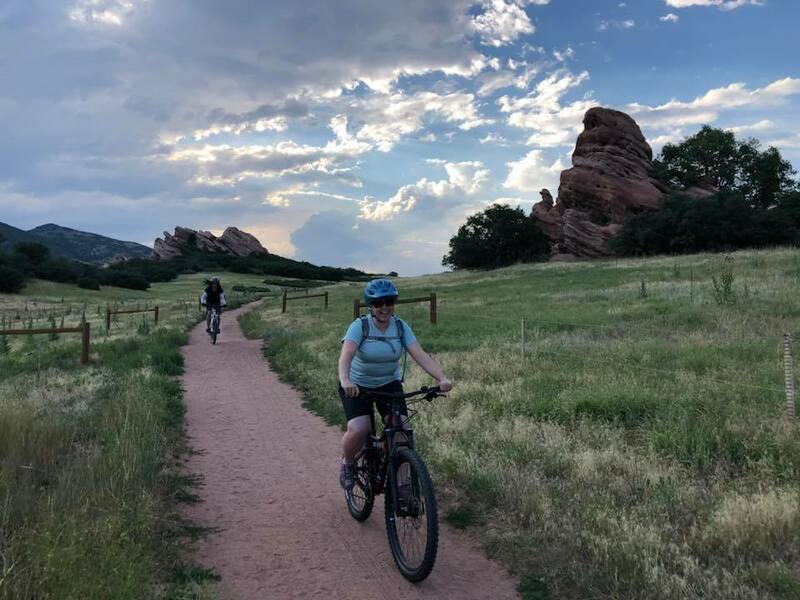 As we prepare for this years Beginner Mountain Bike Course for Women now is a good time to showcase some of our rides from the clinic and offer some additional beginner routes that are fun to check out. 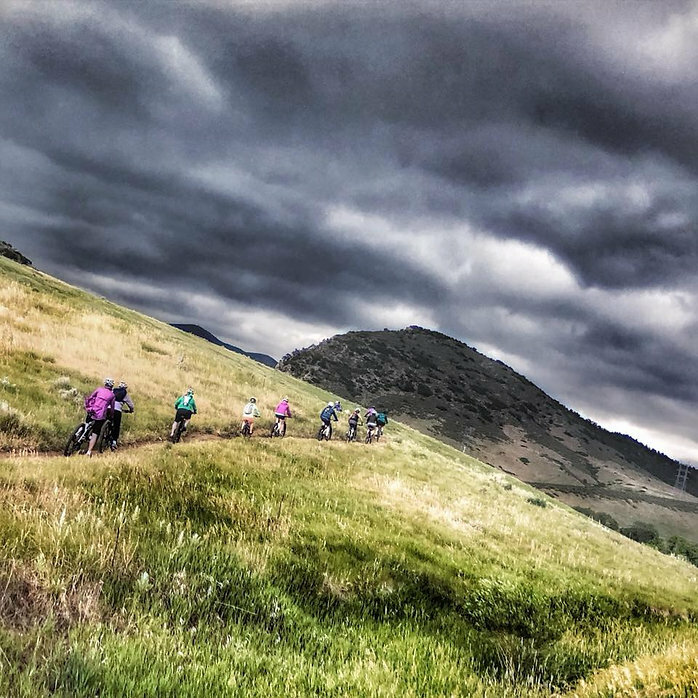 Thanks to our partner Switchback Chics of Colorado for putting together this great list! This is a great beginner ride! Park at the trail head off South Golden Road for a nice easy single track green hill with very few obstacles and little elevation gain. There are only a couple switchbacks and they are nice and wide to help you practice your turns. Once you get to the top of South Table the trail opens up into a great double track that is very flat. Rocks are few and far between, but offer just enough for you to practice on! If you choose to take the Basalt Cap Loop just once you will get a great 5 mile ride in. Do the loop several times to extend your ride and focus on your sighting, shifting and braking skills. Just be aware, South Table is known for it’s rattlesnakes! They love to get sun drunk on the wide open paths, so keep your eyes open and give them their space. For more tips on what to do if you see a snake, read the this article. This is a great but busy trail. Park at the main lot and head to Coyote Song Trail for some little jumps and bumps. I suggest going early or late as there can be many hikers. There is only one very steep section otherwise it is nice open single and double track. Keep your eyes open for the trail signs, there are a couple off shoot trails that can be very challenging! This is one of my favorite places to ride. There are just enough technical areas to work on building up your skills, comfort level and endurance on small slightly technical hills. Add some creek crossings, sand, rolling hills, shaded single track trails and this is one fun ride. There is a $10 per car fee to get into the park, however if you park at the lot across from the Conoco at Morrison and C470, you can ride in for free. Pick a trail, any trail and get to working on building up that endurance! This is a great loop for beginners and isn’t too busy which is great! There is plenty of parking at the trail-head, which makes it great for meeting friends for a ride. It starts out with one decent uphill on a very wide path and then leads into a rolling uphill single track. There are some places with large rocks and loose gravel that make it great to work on developing your comfort level over smaller technical routes. It does wrap through a neighborhood a bit, so make sure to follow all trail signs and enjoy this beautiful loop! This one is a little out of town, but up 285 so you miss the I-70 traffic. If you simply loop the Lodge Pole + Sunny Aspen loop several times it is a very nice green/blue route with plenty of old growth ponderosa pines, aspen and shade for the hotter days. Beginners should avoid the Old Ski Run trail, there are some more advanced blue features along several sections. Be aware it is very popular for hikers and bikers, go early to avoid the crowds. Also, it is very close to the highway and you do get a lot of road noise. Don’t let that stop you from enjoying this beautiful route though! 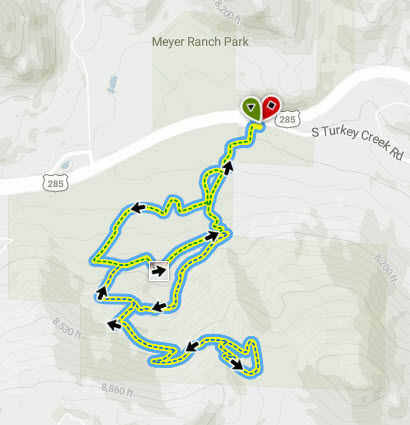 Another amazing shorter option in Conifer is the Flying J Ranch loop. It’s a short loop all in a dense pine forest. Do the loop two times, once in each direction, to practice pacing. Lots of roots and small climbs with very little rocky, technical terrain. You will find many parents taking their young novice mountain bikers to this park for practice. I would consider this one of the harder green/blue trails out there. The easiest route is Sleepy “S” to Meadow View to Painters Pause Trail for a beginner friendly 5ish mile loop. It starts out with a wonderfully gradual hill on double track where you can practice hops over logs and moderate sized rocks, followed by a pretty intense hill with tight switchbacks that come out of nowhere. Make sure to follow the trail signs closely, all other trails in this park are blue/black for good reason! You are very likely to see elk on this trail as it came by it’s name naturally! Enjoy the views, work on your technical skills, take in the pine tree smell and prepare to kick your own bum! Coming out of the woods onto Painter Pause can be a lot of fun if you love speed and want to bomb the downhill, just be aware there is a lot of loose gravel that can send you into the grass if you aren’t paying attention! This park is most known for its “mini-incline” or staircase straight up a 200 step hill climb. The park recently added miles of new trail, designed in the shape of flower petals. 4 loops (or petals) start and end at the athletic fields, each ranging from 1.5 to 3 miles. The trails are pretty smooth with rolling hills, fast and fun curves and some moderate climbs. Plan on seeing lots deer and peregrine falcons on your rides here. We recommend going to this park if you are training for an event or looking to add mileage weekly: as your fitness improves, add another loop! Want more? The town of Castle rock has constructed a 155 foot pedestrian bridge over Wolfensberger Road, linking Philip S. Miller Park with the Ridgeline Open Space. The connection creates a continuous 17- mile trail loop. 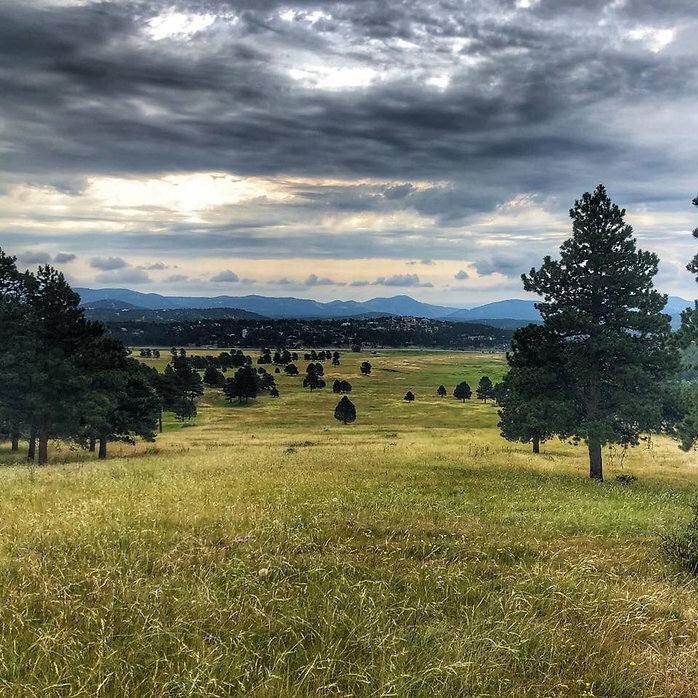 So those seeking greater mileage this park is a great place to train for a longer distance mountain bike race with the mild terrain, gentle (yet relentless climbs) and relatively smooth trails . 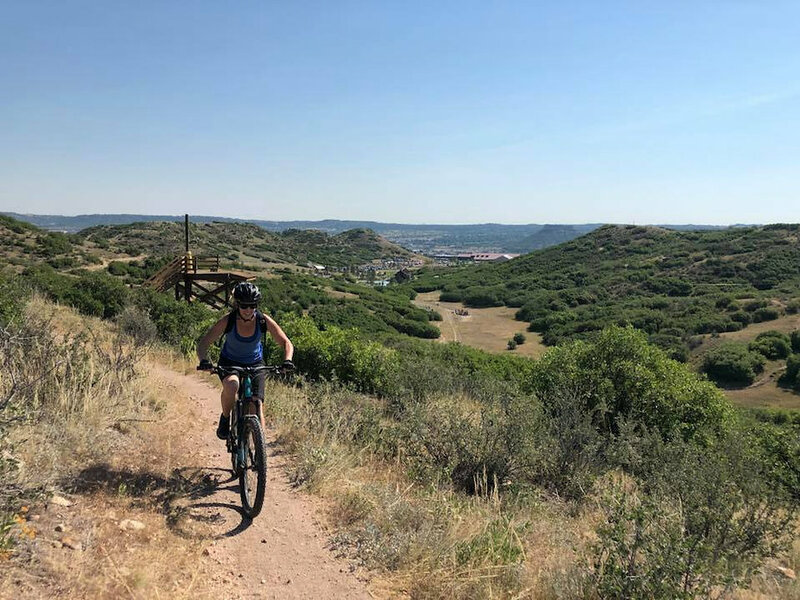 Ruby Hill – located in Denver, this track has the beginner ride around the outside of the park with the routes getting progressively more technical as you work your way in. Valmont Bike Park – located in Boulder, this large 40 acre park has something for everyone! There are plenty of tracks on this one to get a decent distance ride in as well. This park can get busy but because of it’s size you can easily find a track you are comfortable looping. Village Greens North Park – located in Greenwood Village, this is another large pump track with plenty of green and blue runs to check out. I have not had a chance to hit this one, but it looks great and is certainly on my list! Golden Bike Park – located in Golden, right between the North Table Mountain trail-head and New Terrain Brewery, it’s got a great location. This track is very small, with a great kid area and then one larger loop with nice banks, drops and jumps! This track is perfect to hit after a ride of North Table just to have some fun. It’s also rarely busy, which is a bonus. 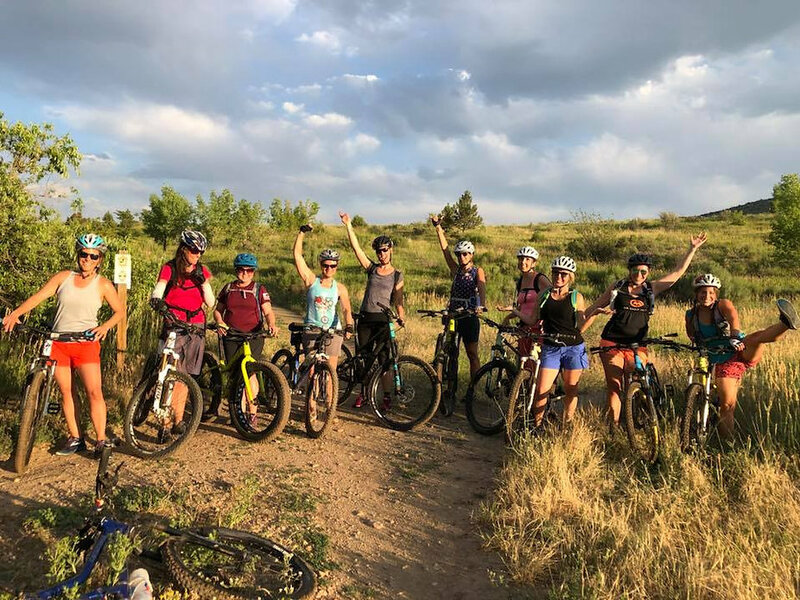 Lastly, check out the Women Mountain Bikers of Colorado! 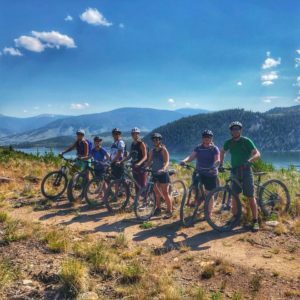 This is a free group where you can post your own rides and meet other women in your area/skill level to bike with! Request to join now HERE. 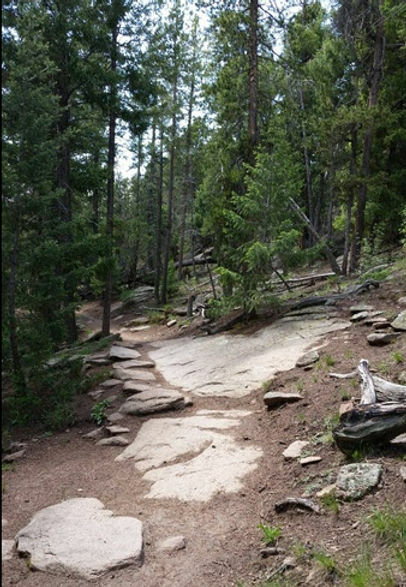 We’d love to hear your favorite beginner trails close to Denver too. 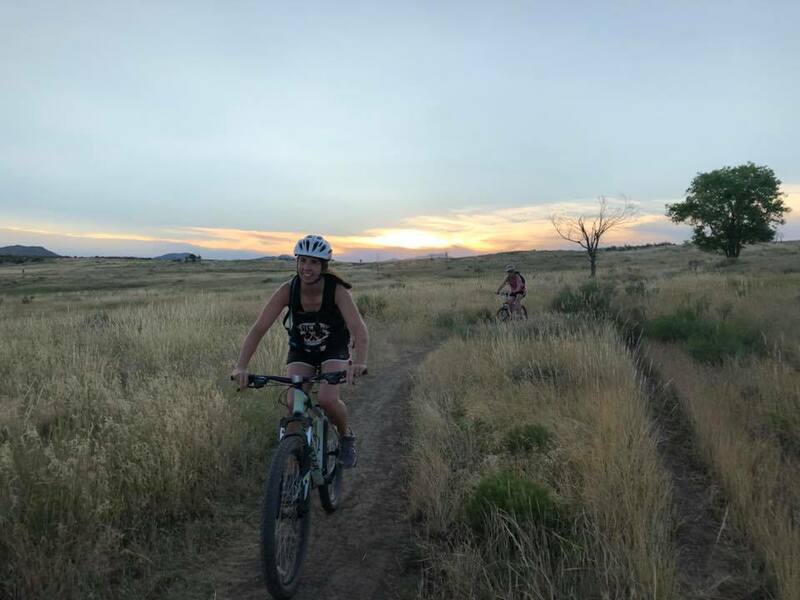 ~ Brie (beginner mnt bike course coach and Switchback Chics of Colorado chapter lead). New to mountain biking or want to work on your rock hopping skills? Check out our women’s beginner mountain bike course AND/OR our women’s training group (for intermediate riders). We meet weekly for guided/coached rides at trails across the front range. Both programs start soon!